What did the world look like as it was transforming into the horrifying apocalypse depicted in The Walking Dead? This spin-off follows new characters as they face the beginning of the end of the world. 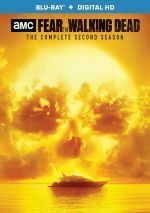 A spinoff from the hugely successful Walking Dead, Fear the Walking Dead started with an abbreviated collection of shows, as its first year spanned a mere six episodes. Season Two runs longer, though, and gives us 15 programs of gory action. I liked S1 so I looked forward to a new collection of shows. This “Complete Second Season” set contains all 15 episodes of Fear. The plot synopses come from the series’ official website. “Monster” starts with a lot of action and ends with intrigue. Between those poles, we mostly find exposition – and fairly sluggish exposition at that. This makes “Monster” a bit flat, but after a year away, it serves to bring us back to the series’ fold in a workable manner. By my reckoning, “Fall” offers half of a good episode. While it manages some interesting threads – usually between Strand and Salazar – parts of it drag. These add up to a decent but slightly frustrating episode. “Ouroboros” carries something of a “lather, rinse, repeat” aura, as it doesn’t deviate much from the template of the first two episodes. That means it presents a moderate amount of intrigue/development with more moping. A little action perks it up but so far S2 remains less enthralling than I’d like. After three sluggish shows, S2 finally clicks to life with “Streets”. I like the backstory accorded to the mysterious Strand, and the development of Alicia’s radio-based relationship with Jack (Daniel Zovatto) adds kick. Hopefully “Streets” marks the start of a good run of episodes. Though not as compelling as “Streets”, “Captive” manages to push along the narrative fairly well. It comes with a chattier vibe than its predecessor but still boasts enough drama to keep the show on its newfound roll. Usually I find myself a little bored with episodes that focus heavily on character interactions, but “Cervus” provides an exception. As our families find their way to shelter, we get a lot of involving threads, and the show explores these in a compelling manner. One of the biggest surprises from S2 comes from the development of Nick. Little more than an annoying junkie in S1, he shows the most real growth of the various roles. I could live without the producers’ apparent need to show him shirtless every episode, but his expansion adds an intriguing element, and other parts of “Shiva” move along S2 well, too. Perhaps I should’ve save my thoughts about “Shiva” for “Grotesque”, as it offers an episode that focuses almost entirely on Nick. That’s an ambitious idea but one that doesn’t work all that well, as the show tends to drag. It does conclude with good new possibilities, though. Most of “Muertos” focuses on character areas, with an emphasis on Nick’s new circumstance. Those elements expand well, and the action beats fare nicely, too, to turn this into an effective program. S2’s biggest thread comes from the splintering of the clan that came together in S1, and “Disturb” accelerates that trend. It also adds some new characters to the mix, and these choices bring us intriguing narrative advancement. “Jessica” provides the least surprising development of S2 when Nick and Luciana get romantic – anyone with half a brain saw that coming the second they met. Other than that trite choice, “Jessica” manages to offer a good show, with a clever attack on the infected and an unusually moving conclusion. My favorite moment of “Salt”: the series’ acknowledgement that Nick has “ratty hair”. His weird “comb-back” style has bugged me since early in S1. Outside of that, “Salt” feels a bit like a placeholder episode, though it does provide progression. In particular, it sets the stage to reunite some of the separated parties. It lacks the excitement of the prior show but still works fine. Best sign we knew Chris’s “friends” were rotten: their ample use of the term “bro”. Chris is the character who’s become least likable in S2, and I actually appreciate that. Not every participant should be warm ‘n’ cuddly, so it’s good to see the series’ willingness to make a core role unsympathetic. “Death” focuses largely on Travis’s side, and that evolution succeeds. If gore fans haven’t been happy with S2 to date, “Wrath” should change that, as it comes with arguably the nastiest attack to date. Beyond that disgusting battle, the episode starts to tie together the various family members, with interesting revelations along the way. It sets up the finale in a satisfying fashion. Season 2 concludes with a relative bang, though it concentrates most on its efforts to reunite our family. As I noted earlier, S2 focused a lot on the way our lead clan splintered, so it seems inevitable that the finale will attempt to bring them back together. “North” ties up the year’s narrative well and leads us toward Season 3. Fear the Walking Dead appears in an aspect ratio of approximately 1.78:1 on this Blu-ray Disc. The shows offered good visuals. Overall definition appeared positive, but I thought the shows could veer toward softness a little more often than expected. Though these occasions weren’t frequent or severe, I felt the image could lack the expected delineation at times. I noticed no jaggies or shimmering, and I witnessed no edge haloes. Source flaws created no distractions. In terms of palette, Fear went with a pretty standard orange and teal. Those hues came across well enough given their limitations. Blacks looked dark and tight, while low-light shots offered nice delineation. Despite some softness, the image usually seemed strong. As for the series’ Dolby TrueHD 5.1 soundtrack, it worked reasonably well. The soundscape opened up the material in a decent manner, though the mix never became terribly involving. Still, various elements fleshed out the spectrum, and a few – such as aircraft and other vehicles – featured the surrounds in a pleasing way. Audio quality satisfied. Speech was distinctive and concise, without edginess or other issues. Music appeared lively and full, while effects showed nice clarity and accuracy. The track wasn’t as good as one would get from a theatrical release, but for a TV series, it seemed positive. “Monster”: co-creator/executive producer Dave Erickson and actor Kim Dickens. Though not a great chat, Erickson and Dickens cover a reasonable array of topics. They get into sets/locations, story and characters, cast and performances, and related production notes. The track sags at times but usually works pretty well. “We All Fall Down”: Erickson and Dickens. See above – the second Erickson/Dickens commentary offers the same strengths and weaknesses as the first. “Ouroboros”: writer/producer Alan Page and actor Cliff Curtis. The quality drops off with this lackluster chat. Page and Curtis mostly just comment on what they see during the episode, and they fail to bring out much insight. Skip it. “Blood in the Streets”: writer Kate Erickson and actor Colman Domingo. More on-topic than its predecessors, Erickson and Domingo bring a fair amount to the table. They touch on the same subjects covered by Dickens and Dave Erickson. Though they drift at times, they usually stay on target and provide a nice look at the episode – this becomes the best of the seven commentaries. “Captive”: executive producer David Alpert and writer Carla Ching. While Alpert and Ching offer some story/character comments, mostly they deliver saucy repartee. This results in some funny moments – such as a discussion of what profanity the series can use – but we don’t learn a ton about the show. “Sicut Cervus”: Alpert. Without Ching, Alpert seems even less informative than he was during the “Captive” commentary. He does little more than crack wise about the show. “Shiva”: Dave Erickson and actor Ruben Blades. Like the other actor/producer tracks, this one offers a reasonable amount of information. It doesn’t work quite as well as the others, but it’s worth a listen. Important question: why do we only get commentaries for the first half of Season Two? Season One included commentaries for all of its shows, so I don’t know why S2 bails along the way. Disc One opens with an ad Geeking Out. Other than the commentaries, all the set’s extras reside on Disc Five. Flight 462 Webisodes offers 14 minutes, of material spread across 17 segments. “462” presents an ancillary story that tells of a plane’s journey during the start of the outbreak. Though it exists to promote the series, it offers an interesting tale of its own. Nine Deleted Scenes fill a total of eight minutes, 13 seconds. These offer short character embellishments. None of them present particularly useful content. Q&A panels like this tend to be promotional and general, and that trend largely holds true here. In particular, the participants lack much freedom because the discussion took place before S2 ran, so they couldn’t get into many details. We get some good insights about characters and a few productions areas, but there’s not a ton of substance on display. Via Inside Fear the Walking Dead, we get 15 separate pieces, each of which addresses one episode. These take up a total of one hour, two minutes, 12 seconds and involve Dave Erickson, Kim Dickens, Ruben Blades, Colman Domingo. Gale Anne Hurd, Debnam-Carey, Cliff Curtis, Lorenzo James Henrie, Paul Calderon, Mercedes Mason, and Frank Dillane. “Inside” focuses on character and story notes, so don’t expect any nuts and bolts information related to the production. These thoughts can be intriguing, but too much of the time, it just feels like those involved tell us what we already know. Though these clips offer some decent thoughts, they lack a lot of substance and feel like Cliff’s Notes versions of the episodes. Finally, The Making of Fear the Walking Dead functions the same as “Inside”, so expect 14 individual episode-based featurettes – oddly, it skips Episode 212. These span a total of 40 minutes, 14 seconds and include comments from Hurd, Henrie, Dickens, Curtis, Debnam-Carey, Alan Page, Blades, Calderon, Domingo, directors Adam Davidson, Christophe Schrewe, Kate Dennis, Andrew Bernstein, and Stefan Schwartz, makeup department head David Dupuis, assistant stunt coordinator Kyle Weishaar, visual effects supervisor Boyd Shermis, prop master Colin Thurston, VFX on-set coordinator Peter Crosman, drone operators Danny Nichols, Billy Clary and Mike Fortin, aerial director of photography Michael Fitzmaurice, director of photography Patrick Cady, assistant prop master Cristina Thurston, stunt coordinators James Armstrong and Randy Hall, stuntmen Carlos Regas and Alex Smith, 2nd AD Isaac Mejjia, head of 3D scanning team Jordan Williams, special effects set coordinator Scott Roark, writer’s assistant Lauren Signorino, production designer Bernardo Trujillo, marine coordinator Jimmy O’Connell, underwater camera tech David McDonald, stunt driver Brett Smrz, and actors Jake Austin Walker, Michelle Ang, Arturo Del Puerto, Sarah McCreanor, Jesse McCartney, Mark Kelly, Karen Bethzabe, Ramses Jimenez, Raul Casso, Andrew Londono, Kelly Blatz, Kenny Wormald, and Alejandro Edda. “Making” examines sets and locations, production design, makeup and effects, camerawork, stunts and props, and other production areas. The various featurettes give us some nice behind the scenes details. They’re brief but they add up to a fun glimpse of the shoot. After a slow start, Season Two of Fear the Walking Dead manages to turn into a solid dramatic experience. The year develops its characters and scenarios in an involving manner and functions well most of the time. The Blu-rays offer generally positive picture and audio as well as a decent batch of supplements. Season Two should satisfy fans of the series.